30% Off Beauty Editor's Picks Orders Over $60. Limited time offer. Free Shipping on orders over $75. No coupon code required. Enjoy 10% off your first order by signing to MAC's email. The code will be supplied to your email when you have signed up. Get up to 75% off sale items. No coupon code required. Shop gift certificates as low as $25. Limited time offer. Enjoy free standard delivery and returns with any purchase. Valid on orders shipped to UK addresses (excluding the Channel Islands). Get a free sample at checkout with your every order. No code required. Get a free mermaid brush with purchase of 220g halo hair. No coupon code required. 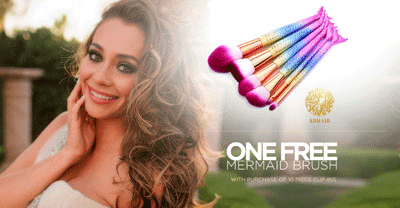 Get a free mermaid brush with purchase of 10 pieces clip-ins. No coupon code required. Only £10 for the hot sale travel size products. No code required. Gift cards from £10. No code required. Mascaras as low as £10. Click for the deal. Make Up For Women Starting at $10. See website for more details. Lipsticks starting at £15.50. Check for more deals.